Added Mammoth, Horse, Troll, Husky. 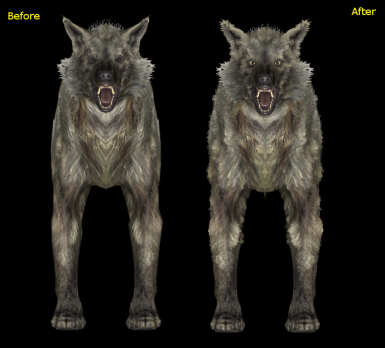 Increase fur volume of animals by Shell Texturing. They become more fluffy. Fix texture mismatch of Bear, HighlandCow, Horse, Skeever. Shell Models require shell textures(Fur cross section map). If Retexture/Remodel Mod does not support shell texturing, It is incompatible.